We’d love your help. 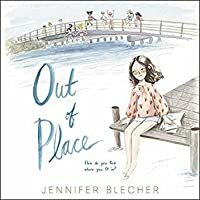 Let us know what’s wrong with this preview of Out of Place by Jennifer Blecher. 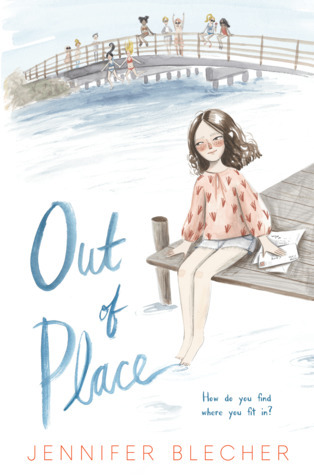 When twelve-year-old Cove Bernstein becomes the target of a school-wide bullying campaign, she sets out to find a way to leave her home on Martha’s Vineyard for New York City, where her best friend lives. But Cove discovers that friends can appear in the unlikeliest places, and maybe home isn’t the worst place to be after all. Jennifer Blecher’s debut novel is a voice-drive When twelve-year-old Cove Bernstein becomes the target of a school-wide bullying campaign, she sets out to find a way to leave her home on Martha’s Vineyard for New York City, where her best friend lives. But Cove discovers that friends can appear in the unlikeliest places, and maybe home isn’t the worst place to be after all. Jennifer Blecher’s debut novel is a voice-driven story about bullying, friendship, and self-reliance that hits the sweet spot for fans of Ali Benjamin’s The Thing About Jellyfish and Erin Entrada Kelly’s You Go First. Twelve-year-old Cove Bernstein’s year has gone from bad to worse. First, her best friend, Nina, moved from Martha’s Vineyard to New York City. Then, without Nina around, Cove became the target of a bullying campaign at school. Escape seems impossible. But opportunities can appear when you least expect them. Cove’s visit to a secondhand clothing store leads her to a surprising chance to visit Nina, but only if she can win a coveted place in a kids-only design competition. Cove doesn’t know how to sew, but her friend at the retirement home, Anna, has promised to teach her. And things start really looking up when a new kid at school, Jack, begins appearing everywhere Cove goes. Then Cove makes a big mistake. One that could ruin every good thing that has happened to her this year. One that she doesn’t know how to undo. Jennifer Blecher’s accessible and beautifully written debut novel explores actions and consequences, loneliness, bullying, and finding your voice. This voice-driven friendship story is for fans of Rebecca Stead’s Goodbye Stranger and Jodi Kendall’s The Unlikely Story of a Pig in the City. To ask other readers questions about Out of Place, please sign up. Thank you so much to the author and publisher for sending me a copy of this ARC. Cove is lost without her best friend, Nina, who just moved to New York City. She has trouble finding a new place where she belongs, and becomes the target for some girls at school who start a campaign to wear a message on their shirts that affect the her, and the morale of the school. Nina is desperate to find a way to get to see Nina in New York, and accidentally comes across an opportunity to audition for a TV des Thank you so much to the author and publisher for sending me a copy of this ARC. Cove is lost without her best friend, Nina, who just moved to New York City. She has trouble finding a new place where she belongs, and becomes the target for some girls at school who start a campaign to wear a message on their shirts that affect the her, and the morale of the school. Nina is desperate to find a way to get to see Nina in New York, and accidentally comes across an opportunity to audition for a TV design show aimed at kids, with the main prize being the chance to go to New York. But Nina's desperation results in a bad decision, and before she knows it, what she's created is a complicated problem that she doesn't know how she's going to fix. I love stories that take place on the brink of adolescence, where you can see a character tentatively testing the waters beyond their familiar borders. Cove still wants things to be the way they were before, to play mermaids with Nina and remain within the safe boundaries of their friendship. You still see her innocence as she she is forced out of her comfort zone, and starts to question the limitations that have been placed on her. It's a bittersweet summer of transition that the author captures so well. You are a gift to the world of middle-grade literature. Growing up is hard, and few authors get the intricacies of what it is like to grow up feeling out of place in such a beautifully relatable way! 10-year-old India, moving from place to place needed this exact book. Cove has lived her entire life on Martha's Vineyard with a mother who teaches yoga, loves kale, and refuses to buy commercial clothing. Her best friend Nina has been her grounding force until Nina's dads decide Oh Cove, Cove, Cove. Cove has lived her entire life on Martha's Vineyard with a mother who teaches yoga, loves kale, and refuses to buy commercial clothing. Her best friend Nina has been her grounding force until Nina's dads decide to move to New York City, now Cove is left battle the world of bullies and loneliness on her own. When she meets a young writer named Jonah and learns all about the hip show Create You a fashion design show for teens (which I wish was real because I would watch it in a heartbeat!) she finds her chance to visit Nina in the big city and FINALLY get off of the island that's been her entire life. Cove lives in Martha's Vineyard with her artist mom and she has never left the island in her 12 years. Her mom refuses to leave, even for a trip. Cove's best friend, Nina, is moving to New York City so her dad can try selling his artwork there. Cove is devastated. She is bullied by the other girls on the island, and really has no other friends. Once Nina moves Cove decides to apply to be on a reality show called "Create You" so she can go to New York and find Nina. There's only one problem, Cove doesn't know how to sew. With the help of her friend, Anna (who lives in a retirement home), Cove begins learning how to sew. Things go terribly wrong though when Cove makes a decision that she is not ready for. Review copy courtesy of Edelweiss. I greatly enjoyed this contemporary middle grade book about a girl named Cove who is devastated after her best friend moves away. She turns to learning to sew while watching a Project Runway esque reality show, and this leads her down a series of adventures. Will definitely be purchasing!